The Republican Party’s foreign policy endorses the tradition of world leadership and involvement, not intervention. Republicans believe in prioritizing national interests, the trust of allied governments, and the security of Israel. The Republican Party still believes that the country of Iran is actively sponsoring terrorism, building nuclear weaponry, and is abusing the human rights of its population. Republicans believe in using all options available when dealing with any situations that threaten U.S. security and the security of our international friends. The Republican Party is very supportive of the destruction of ISIS, the Islamic State and providing assistance to those communities that have been victimized by ISIS. Republicans believe in utilizing all political, economic, and military assets for the establishment of a safe haven in Iraq to protect minorities facing genocide in the region at the hands of ISIS. 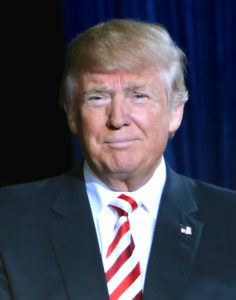 In the 2016 Presidential Race, Donald Trump was in favor of achieve peace through strength and advancing America’s core interests of regional stability and relaxed tensions throughout the world. Trump was in favor of rebuilding the military as well as its intelligence and cyber capabilities but vouched to end the nation-building strategies that have been implemented in the past. Trump supports pursuing aggressive military procedures in order to destroy ISIS and cut off their support networks. Trump believes that Iran is the largest sponsor of terrorism and that it now has more funds as a consequence of the U.N. releasing the sanctions on Iran. Donald Trump was the victor of the 2016 Presidential Election. In 2012, Mitt Romney stated that he believed preventing Iran from accessing nuclear weaponry should be at the top of the U.S. national security priority list. At that time he did not believe that military aggression was necessary at the time and was open to direct diplomacy. Romney was very supportive of the dismantling of Iran’s nuclear weapon program and believed a regime change was necessary. At that time, he stated that he supported crippling economic sanctions and a display of American military might to dissuade Iran from further misconduct. In years past, he was critical of the U.N. allowing Mahmoud Ahmadinejad to speak at the United Nations General Assembly. He stated that Ahmadinejad should be indicted under the Genocide Convention for threats against Israel. In March of 2015, John McCain signed on to the letter addressed to Iran’s leadership, originally written by Arkansas Senator Tom Cotton. The letter clearly addressed the recent nuclear deal with President Obama, stating that Obama signed the deal without congressional approval. Consequently, the deal was technically an executive agreement that could be overturned by a new president. The letter and its 47 signers were met with international backlash.